SAN DIEGO — February 11, 2016 – Qualcomm Incorporated (NASDAQ: QCOM) today announced that its subsidiary, Qualcomm Technologies, Inc., has introduced its sixth-generation discrete LTE multimode chipset — the Qualcomm® Snapdragon™ X16 LTE modem, which is built on a leading-edge 14nm FinFET process — and the Qualcomm RF Transceiver, WTR5975. The Snapdragon X16 LTE modem is the first commercially announced Gigabit Class LTE chipset designed to deliver fiber-like LTE Category 16 download speeds of up to 1 Gbps, supporting up to 4×20 MHz downlink Carrier Aggregation (CA) across FDD and TDD spectrum with 256-QAM, and 2×20 MHz uplink carrier aggregation plus 64-QAM for uplink speeds up to 150 Mbps. The Snapdragon X16 LTE modem is the first instantiation of Qualcomm Technologies’ new, advanced modem architecture. 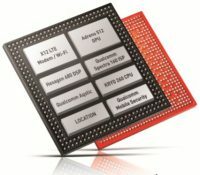 This highly scalable architecture, with modular components and common software, will allow Qualcomm Technologies to rapidly evolve its modem product line to address a wide range of connected applications, ranging from ultra-fast mobile broadband to power-efficient connectivity for Internet of Things (IoT) devices. The Snapdragon X16 LTE modem also supports Licensed Assisted Access (LAA), the global standard for LTE in unlicensed spectrum, becoming the mobile industry’s first commercially announced LTE Advanced Pro modem. LTE Advanced Pro, beginning with 3GPP Release 13, marks an important next phase for 4G that will expand the technology into new applications and usage models, establishing the foundation for unified and more capable connectivity platforms into the next decade. The Snapdragon X16 LTE modem is designed to reach Gigabit Class LTE speeds using the same amount of spectrum as Category 9 LTE devices. By using carrier aggregation and 4×4 MIMO, the Snapdragon X16 LTE modem can receive 10 unique streams of data using only three 20 MHz carriers. Its support for 256-QAM boosts the peak throughput of each stream from ~75 Mbps to ~100 Mbps, with additional gains possible with modem data compression. Additionally, with support for LAA as well as LTE-U, this combination reduces the amount of licensed spectrum required – to 40 MHz or less – to vastly expand the number of operators that can deploy Gigabit Class LTE speeds around the globe. In addition to the advanced connectivity feature sets, the new modem and transceiver support Snapdragon All Mode, including all major cellular technologies (LTE FDD, LTE TDD, WCDMA, TD-SCDMA, EV-DO, CDMA 1x, and GSM/EDGE), frequency bands, Carrier Aggregation band combinations, LTE dual SIM, LTE Broadcast, HD and Ultra HD Voice over LTE (VoLTE) with single radio voice call continuity to 3G and 2G. The Snapdragon X16 LTE modem pairs with the new WTR5975 RF transceiver, the world’s first single-chip RF IC supporting Gigabit Class LTE, LTE-U and LAA with 5 GHz unlicensed band support. The highly integrated WTR5975 supports up to 4x downlink CA, 2x uplink CA, all 3GPP-approved bands, including 3.5GHz bands 42 and 43, and 4×4 MIMO in a single transceiver chip, dramatically reducing the footprint required to support advanced CA and MIMO configurations. The WTR5975 also features a new digital interconnect interface designed to facilitate PCB layout in advanced LTE devices by simplifying routing between the modem and transceiver. The Snapdragon X16 LTE modem pairs with Qualcomm Technologies’ Qualcomm® RF360™ QET4100 Envelope Tracker to provide a major advancement in LTE power efficiency with the world’s first announced 40MHz envelope tracking solution for LTE FDD and LTE TDD. The Snapdragon X16 LTE modem, WTR5975 and QET4100 are designed and optimized together as a system to support fast downloads, swift application performance, as well as provide enhanced thermal efficiency and optimized power consumption. The new chipset is designed to enable a broad range of connected platforms from smartphones, tablets, and mobile computing devices to cars, drones and virtual reality headsets. With Gigabit Class LTE speeds, users will be able to take advantage of breakthrough features, such as live streaming of 360 degree virtual reality content and faster, more seamless access to cloud-based applications and services. Snapdragon X16 LTE modem, WTR5975 and QET4100 samples are available now, with first commercial products expected in second half of 2016.